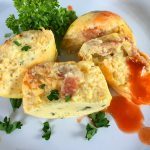 This recipe for Instant Pot Bacon Cheddar egg bites is super easy to make and absolutely delicious. We’ll use just a few easy ingredients and your favorite pressure cooker to make these unbelievably tasty breakfast treats. available online. There’s lots of different colors and styles, but the popular ones are the 7 cup molds. They’re just the right size to fit in a 6 quart or 8 quart Instant Pot. The ingredients for this recipe are real easy – eggs, shredded cheddar cheese, bacon (i use the pre-cooked microwave bacon), some cottage cheese and some heavy cream. The way these ingredients come together and cook so well in the Instant Pot is amazing. The final dish is a creamy, rich and delicious egg treat! And they’re perfect to save in the fridge and to bring to work. Add eggs, cottage cheese, cheddar cheese and heavy cream to a blender and blend until smooth – about 30 seconds. Then stir in the parsley flakes. Spray inside of silicone egg bite molds with some non-stick cooking spray and then add crumbled bacon to the bottom of each cup. Then pour egg mix into each cup, but not all the way to the top, leave a little room on top. Cover fill egg bite mold with aluminum foil. Add a cup of water the bottom of the Instant pot, and lower down the egg bite mold on the trivet, into the pot. Set to steam for 8 minutes with vent closed. After cooking time is complete, let natural release for 10 minutes, the go ahead and quick release. Carefully remove from pot, remove foil, and let set for about 5 minutes for the egg bites set. Serve with fresh ground black pepper and hot sauce!